The Illamasqua Broken Gel in Gold is part of the ‘Aftermath’ collection. The smooth, gel-based formula glides across the lid, infused with iridescent gold-fleck particles to create a glistening metallic layer that’s perfect worn alone or layered over eye shadow for an intensified effect. 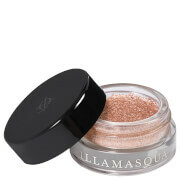 Dab at the inner corners of your eyes to instantly brighten, or pat lightly along cheekbones for a majestic radiance. I’m not really sure what I thought this would be like but it exceeded my expectations. It’s more a subtle shimmer than full on glitter but defo buildable. It’s a gel which dries down and becomes budgeproof- this is what impressed me the most. I’m a big fan of using glitter in my make up looks this is definitely a permanent adiition. Love it. Absolutely love it! Everytime I wear it I get tonnes of compliments. It looks amazing in the inner corner of the eye as a highlight. I first seen broken gold being used by a beauty vlogger a couple of years ago and it looked amazing. Unfortunately its been out of stock for a long time so when I seen it as part of the aftermath collection I had to buy it. Instead of an intense gold its a clear gel with a few gold flecks in it. Even after leaving it to dry on my lid and reapplying it the colour was still very poor quality, not what I was expecting. Really disappointed in this purchase, was going to perhaps buy the silver version too, but that won't be happening now, Sorry Illamasqua I feel let down by you.